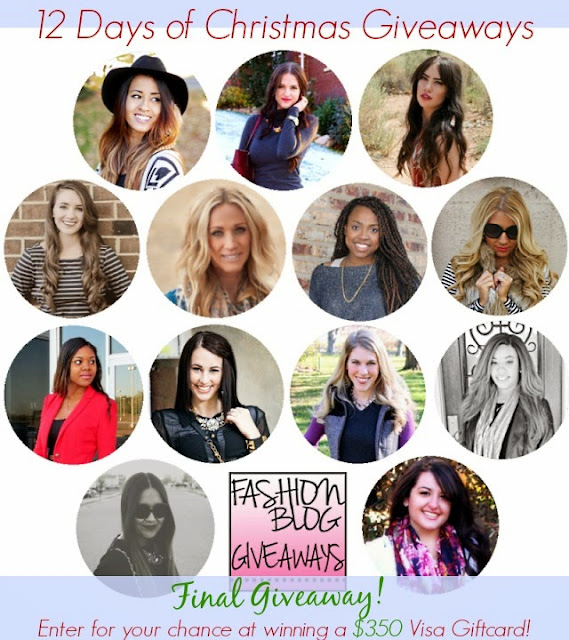 The Parlor Girl: 12th Day of Christmas ~ $350 Visa Gift Card Giveaway!!! 12th Day of Christmas ~ $350 Visa Gift Card Giveaway!!! I have some very exciting news for you all! Today marks the last and final day of our 12 Days of Christmas Giveaways and we have a great grand prize for one lucky winner to top it all off! YES, you read right! Now what are you waiting for? Enter by using the rafflecopter below! And in case you missed the other giveaways, you still have a chance to get in on the action by clicking the photo below. I'd buy a new camera! This has been such an amazing giveaway! You are all awesome! With $350 I'd definitely spend it on Christmas presents for my family! I want so many things. But most of all I want to be able to buy my family and friends presents this year. Luckily i won a few etsy earrings to give to close friends through giveaways. This would really help out at Christmas! Love you ParlorGirl! I want to buy my son a swing set! I would take my hubby shopping! a gigi new york planner and some other things i've been eyeing! I'd use it for textbooks. That would be utterly amazing to win! I would buy knee pillows for a fabulous night sleep, some lovely presents, and skin care stuffs I've been coveting. I hope this isn't a double post? I would love a knee pillow for great sleep, some presents and lovely coveted skin care stuffs. I would buy clothes! Some sweater dresses or tunics, warm leggings and a real live jacket!